Jason and Andzelika are licensed real estate consultants in Pinellas county, Florida. They have contacts with many banks. They live in Tarpon springs but also serve Clearwater but they also serve: Clearwater, Clearwater Beach, Dunedin, Palm Harbor, Tarpon Springs, Trinity, Tampa, Odessa, Lutz and many more that need to be explored! 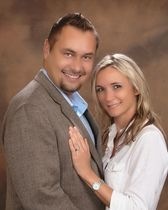 Jason and Andzelika can find you the home and community you want and need! Together they make a great team .The knowledge of the market makes them experts in the area. They can help you sell or buy your home in the community you want and need. They both speak Polish. Jason Duraj and Andzelika są licencjonowanymi pośrednikami nieruchomości w Pinellas County na Florydzie. Mieszkają w Spring Hill ale obsługują także między innymi: Clearwater, Clearwater Beach, Dunedin, Palm Harbor, Tarpon Springs, Trinity, Tampa, Odessa, Lutz. Jason i Andzelika mają szerokie kontakty z wieloma bankami. Oboje mówią po polsku. 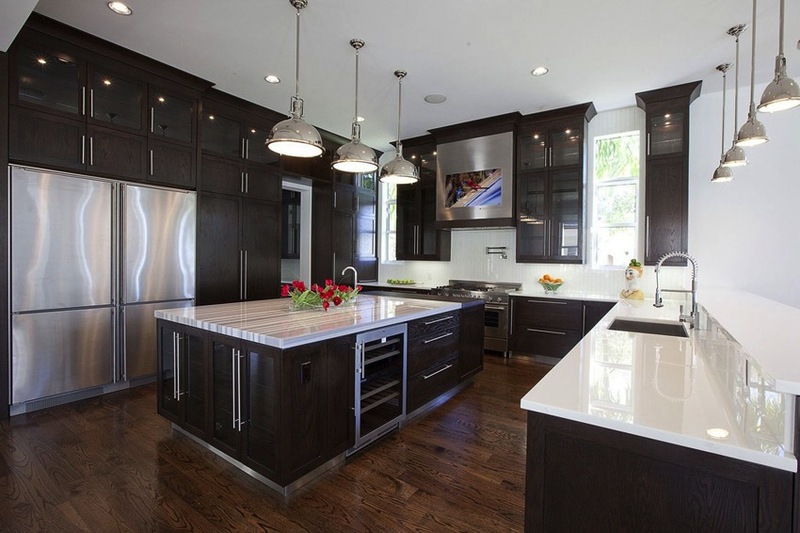 Florida Kitchen & Bath cabinets would like to extend a special deal, for limited time only, as part of our Grand Opening: beautiful kitchen cabinets worth $5,000 a piece for only $1,999 each! That’s over 50% off as a special offer to get the word out about our newly opened store. This stunning piece of furniture is truly worth double the price we are asking and this bargain will be gone soon so come and see it in person. The owners speak Polish. Zapraszamy na wielkie otwarcie nowo otwartego sklepu oferującego wysokiej jakości meble kuchenne i łazienkowe. Z okazji otwarcia nowego sklepu, właściciele oferują ponad 50% zniżkę na sprzedaż luksusowych mebli kuchennych. Właściciele mówią po polsku. 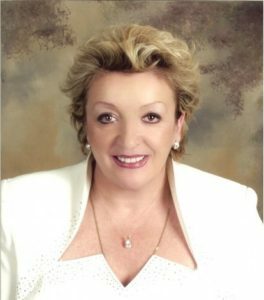 Donna Mazurek is a Polish realtor serving clients in Pasco, Hillsborough, Pinellas and Hernando County. Donna has 31-year experience in real estate and can help you with all your real estate needs including residential and commercial property, houses and lots. Donna is also a court certified translator. Donna speaks Polish. Anytime Air, Inc. has over 10 years experience and we’ve been lucky enough to learn a thing or two over those years. We’ve worked hard to make sure that our staff knows the most up-to-date information about all of your heating and cooling needs. Keeping you comfortable is our goal! While you might be tempted to hire a local handyman to handle your air conditioning repairs, something as important as your home’s cooling and heating system should only be trusted to a trained and experienced licensed professional. Not only will our technician have the necessary training, tools and experience to deliver the very best in repairs and service, but they will also be able to provide quality replacement parts for optimal performance of your cooling and heating system. Whether you are installing a new system or replacing existing heating and cooling equipment, installing equipment properly is essential to getting the best performance and longest equipment life. No matter what type of cooling system you have, you will eventually need a professional repair. Repairs will be needed occasionally regardless of the system brand. Anytime Air, Inc. ma ponad 10 lat lat doświadczenia w sektorze ogrzewania i klimatyzacji. Komfort klientów jest naszym celem! Podczas gdy zatrudnienie lokalnego “złotej rączki” może wydawać się atrakcyjne, w sprawach tak ważnych jak ogrzewanie i klimatyzacja potrzebna jest ekspertyza doświadczonego i licencjonowanego specjalisty. Anytime Air, Inc. oferuje nie tylko pomoc wyspecjalizowanych techników w naprawie i serwisie systemów grzewczych i chłodzeniowych, ale również najwyższej jakości materiały i części zastępcze aby zapewnić optymalne funkcjonowanie systemów. Anytime Air, Inc. oferuje: Serwis, Naprawę oraz Instalację systemów grzewczych i klimatyzacji. Wiktor Gawel is a Polish handyman in Tampa Bay, FL. 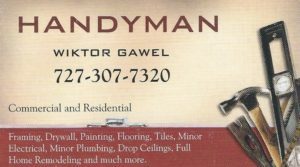 He specializes in framing, drywall, painting, flooring, tiles, minor electrical, minor plumbing, drop ceilings, full home remodeling and much more. Commercial and residential. Wiktor speaks Polish. Wiktor Gawel jest “złotą rączką” i może pomóc we wszelkich naprawach, remontach, instalacjach w domach prywatnych oraz dla firm. Wiktor mówi po polsku. Mike Kaluza is a Polish realtor in Hillsborough County, Florida. He also serves Pasco and Pinellas Counties. Mike specializes in residential, commercial, investment real estate. He speaks Polish and is available seven days a week. Mike Kaluza jest polskim pośrednikiem nieruchomości w Hillsborough County na Florydzie. Mike obsługuje również Pasco i Pinellas Counties. Mike specjalizuje się w nieruchomościach mieszkalnych i komercyjnych, jak również inwestycyjnych. Mike mówi po polsku i jest do dyspozycji przez siedem dni w tygodniu. Właściciel Suncoast Indoor Billboard Network, Peter Stolc, pochodzi z Gdyni i mówi po polsku. Promuj swój biznes i zostań partnerem w sieci bilboardów. Magdalena Smyl is a Licensed Insurance Agent serving Pinellas, Hillsborough, Pasco, Polk, Sarasota, Manatee, and Hardee counties. 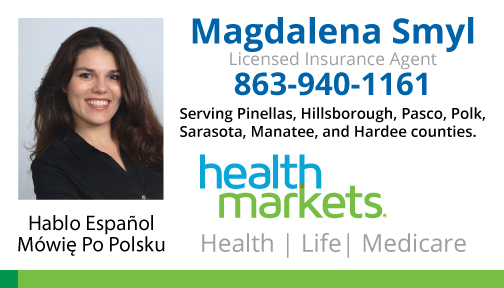 Magdalena speaks Polish and Spanish and can help with you with all your insurance needs, including health insurance, medicare and life insurance. Magdalena Smyl jest licencjonowanym agentem ubezpieczeniowym obsługującym klientów w Pinellas, Hillsborough, Pasco, Polk, Sarasota, Manatee, and Hardee. Magdalena mówi po polsku i po hiszpańsku i może pomóc Ci załatwić ubezpieczenie zdrowotne, medicare oraz ubezpieczenie na życie. Monika Bartoszcze is a Regional Account Manager at GIT Florida Title Services. GIT Title Services provides title search and title insurance services in Tampa/ Clearwater/ St. Petersburg. 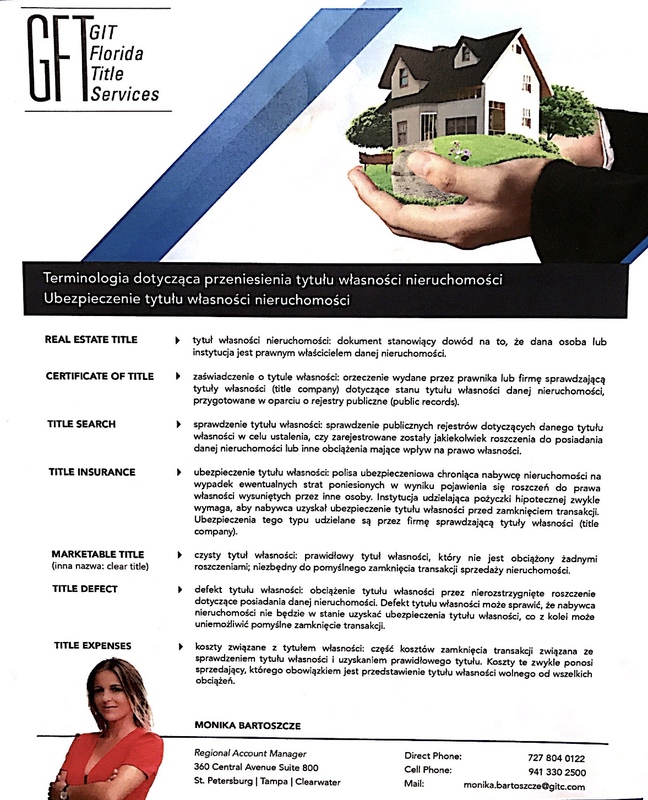 If you need an experienced Polish-speaking title agent for closing, you can contact Monika at (727) 804 – 0122. 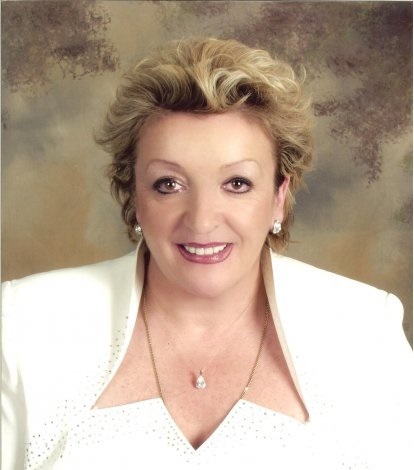 Monika is a Pinellas Realtor Organization Affiliate and a member of Women’s Council of Realtors Chicago/ Tampa Chapter. Monika Bartoszcze jest regionalnym managerem w GIT Florida Title Services. GIT Title Services oferuje sprawdzenie tytułu własności nieruchomości, ubezpieczenie tytułu własności oraz gwarancję “czystego” tytułu własności przy kupnie nieruchomości. Monika jest doświadczonym realtorem i mówi po polsku. Are you thinking about buying or renting a single family home, mobile home, townhome, duplex, triplex, or condo in the Tampa Bay area? Thinking about purchasing or leasing land, real estate, a business, commercial or in investment property in the Tampa, Florida area? 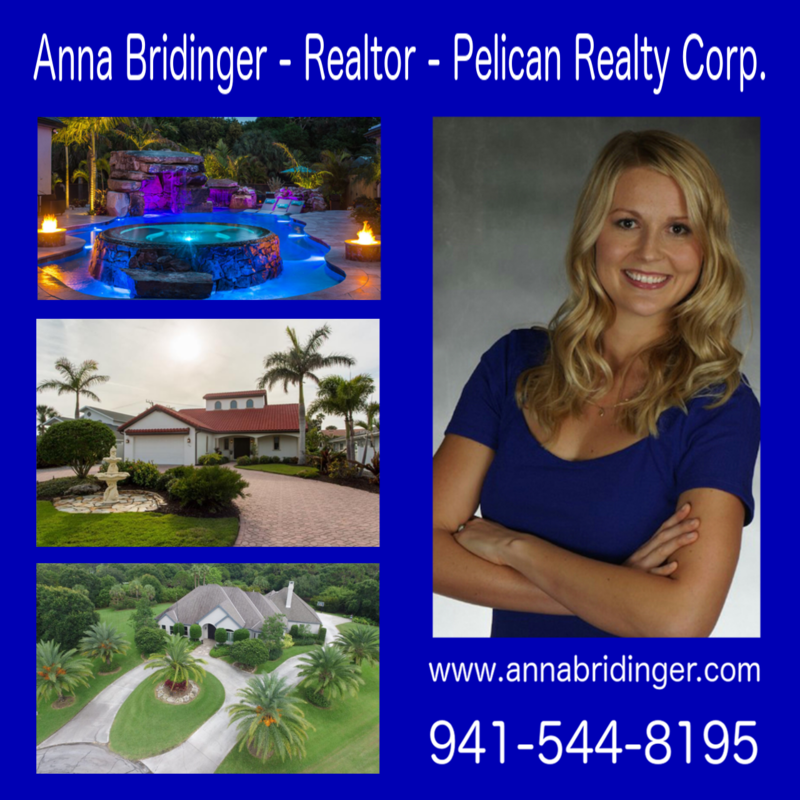 Our Polish business directories have comprehensive lists of investment property specialists, realtors, real estate agents and brokers in the Tampa Bay area who speak Polish fluently. If you are thinking about relocating to the Tampa Bay area and are looking for a Polish speaking real estate attorney, closing title company, accountant, realtor, real estate agent, broker, contractor, property manager, insurance agent or would like to find Polish businesses in the Tampa area please visit our Polish business directories. 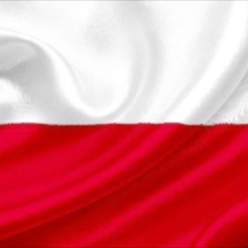 Our Polish business directories have a comprehensive list of accountants, realtors, real estate agents, brokers, contractors, insurance agents and many other Polish speaking businesses and service providers in the Tampa Bay area. Our Polish business directory can help you find a Polish speaking real estate attorney, closing agent, accountant, property manager, investment property specialist, realtor, real estate agent or broker in Tampa, Florida. Our Polish business directory can help you find a Polish speaking real estate attorney, closing agent, accountant, property manager, investment property specialist, realtor, real estate agent or broker in Bayview. Our Polish business directory can help you find a Polish speaking real estate attorney, closing agent, accountant, property manager, investment property specialist, realtor, real estate agent or broker in Beverly Hills. Our Polish business directory can help you find a Polish speaking real estate attorney, closing agent, accountant, property manager, investment property specialist, realtor, real estate agent or broker in Brandon. Our Polish business directory can help you find a Polish speaking real estate attorney, closing agent, accountant, property manager, investment property specialist, realtor, real estate agent or broker in Brooksville. Our Polish business directory can help you find a Polish speaking real estate attorney, closing agent, accountant, property manager, investment property specialist, realtor, real estate agent or broker in Crystal River. Our Polish business directory can help you find a Polish speaking real estate attorney, closing agent, accountant, property manager, investment property specialist, realtor, real estate agent or broker in Dade City. Our Polish business directory can help you find a Polish speaking real estate attorney, closing agent, accountant, property manager, investment property specialist, realtor, real estate agent or broker in Dover. Our Polish business directory can help you find a Polish speaking real estate attorney, closing agent, accountant, property manager, investment property specialist, realtor, real estate agent or broker in Gibsonton. Our Polish business directory can help you find a Polish speaking real estate attorney, closing agent, accountant, property manager, investment property specialist, realtor, real estate agent or broker in High Point. Our Polish business directory can help you find a Polish speaking real estate attorney, closing agent, accountant, property manager, investment property specialist, realtor, real estate agent or broker in Holiday. Our Polish business directory can help you find a Polish speaking real estate attorney, closing agent, accountant, property manager, investment property specialist, realtor, real estate agent or broker in Hudson. Our Polish business directory can help you find a Polish speaking real estate attorney, closing agent, accountant, property manager, investment property specialist, realtor, real estate agent or broker in Lakeland. Our Polish business directory can help you find a Polish speaking real estate attorney, closing agent, accountant, property manager, investment property specialist, realtor, real estate agent or broker in Land O’ Lakes. Our Polish business directory can help you find a Polish speaking real estate attorney, closing agent, accountant, property manager, investment property specialist, realtor, real estate agent or broker in Lithia. Our Polish business directory can help you find a Polish speaking real estate attorney, closing agent, accountant, property manager, investment property specialist, realtor, real estate agent or broker in Lutz. Our Polish business directory can help you find a Polish speaking real estate attorney, closing agent, accountant, property manager, investment property specialist, realtor, real estate agent or broker in Mulberry. Our Polish business directory can help you find a Polish speaking real estate attorney, closing agent, accountant, property manager, investment property specialist, realtor, real estate agent or broker in New Port Richey. 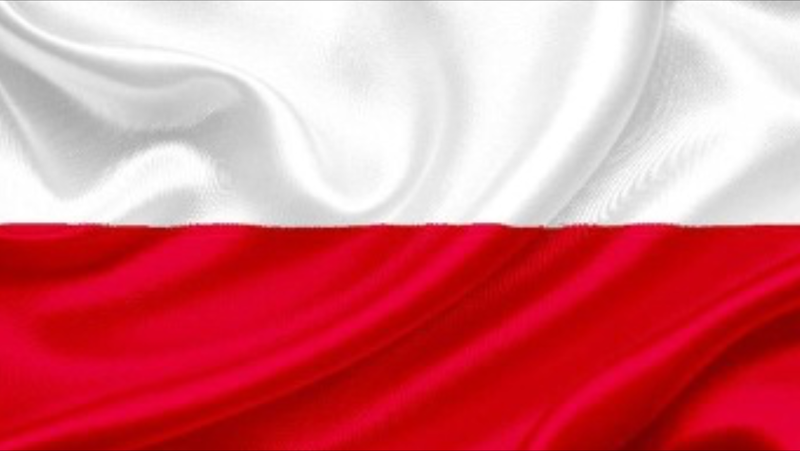 Our Polish business directory can help you find a Polish speaking real estate attorney, closing agent, accountant, property manager, investment property specialist, realtor, real estate agent or broker in Odessa. Our Polish business directory can help you find a Polish speaking real estate attorney, closing agent, accountant, property manager, investment property specialist, realtor, real estate agent or broker in Oldsmar. Our Polish business directory can help you find a Polish speaking real estate attorney, closing agent, accountant, property manager, investment property specialist, realtor, real estate agent or broker in Plant City. Our Polish business directory can help you find a Polish speaking real estate attorney, closing agent, accountant, property manager, investment property specialist, realtor, real estate agent or broker in Polk City. Our Polish business directory can help you find a Polish speaking real estate attorney, closing agent, accountant, property manager, investment property specialist, realtor, real estate agent or broker in Port Richey. Our Polish business directory can help you find a Polish speaking real estate attorney, closing agent, accountant, property manager, investment property specialist, realtor, real estate agent or broker in Riverview. Our Polish business directory can help you find a Polish speaking real estate attorney, closing agent, accountant, property manager, investment property specialist, realtor, real estate agent or broker in Ruskin. Our Polish business directory can help you find a Polish speaking real estate attorney, closing agent, accountant, property manager, investment property specialist, realtor, real estate agent or broker in Seffner. Our Polish business directory can help you find a Polish speaking real estate attorney, closing agent, accountant, property manager, investment property specialist, realtor, real estate agent or broker in Spring Hill. Our Polish business directory can help you find a Polish speaking real estate attorney, closing agent, accountant, property manager, investment property specialist, realtor, real estate agent or broker in Sun City Center. Our Polish business directory can help you find a Polish speaking real estate attorney, closing agent, accountant, property manager, investment property specialist, realtor, real estate agent or broker in Sunset Beach. Our Polish business directory can help you find a Polish speaking real estate attorney, closing agent, accountant, property manager, investment property specialist, realtor, real estate agent or broker in Tampa. Our Polish business directory can help you find a Polish speaking real estate attorney, closing agent, accountant, property manager, investment property specialist, realtor, real estate agent or broker in Tarpon Springs. Our Polish business directory can help you find a Polish speaking real estate attorney, closing agent, accountant, property manager, investment property specialist, realtor, real estate agent or broker in Temple Terrace. Our Polish business directory can help you find a Polish speaking real estate attorney, closing agent, accountant, property manager, investment property specialist, realtor, real estate agent or broker in Thonotosassa. Our Polish business directory can help you find a Polish speaking real estate attorney, closing agent, accountant, property manager, investment property specialist, realtor, real estate agent or broker in Valrico. Our Polish business directory can help you find a Polish speaking real estate attorney, closing agent, accountant, property manager, investment property specialist, realtor, real estate agent or broker in Weeki Wachee. Our Polish business directory can help you find a Polish speaking real estate attorney, closing agent, accountant, property manager, investment property specialist, realtor, real estate agent or broker in Weekiwachee Gardens. Our Polish business directory can help you find a Polish speaking real estate attorney, closing agent, accountant, property manager, investment property specialist, realtor, real estate agent or broker in Wesley Chapel. Our Polish business directory can help you find a Polish speaking real estate attorney, closing agent, accountant, property manager, investment property specialist, realtor, real estate agent or broker in Ybor City. Our Polish business directory can help you find a Polish speaking real estate attorney, closing agent, accountant, property manager, investment property specialist, realtor, real estate agent or broker in Zephyrhills.